Duchess Meghan stepped out in an & Other Stories polka dot dress, priced at $163, as she and Prince Harry arrived at Fraser Island in Queensland on day seven of their royal tour of Australia on Monday. The 37-year-old royal - who is expecting her first child next spring - has showcased one of her most affordable outfits yet, as she donned a burgundy and white polka dot maxi dress by H&M's Swedish sister brand, & Other Stories. 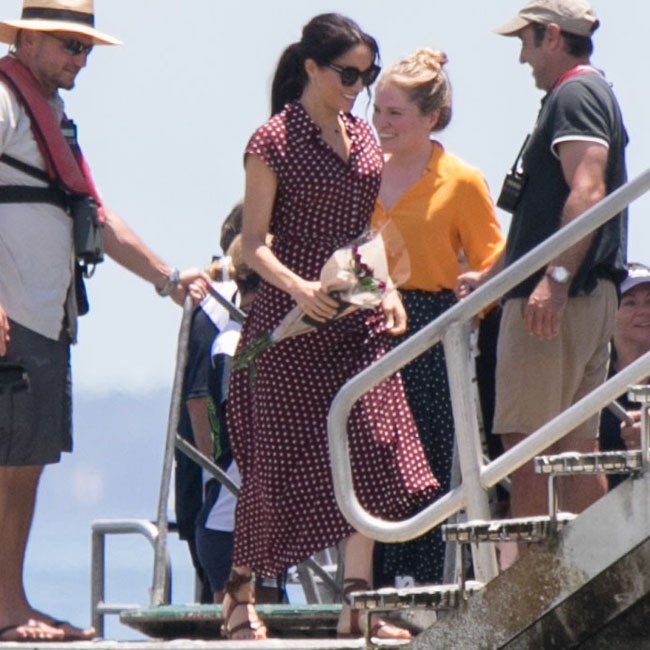 The duchess opted for the gorgeous dress as she arrived by boat to Kingfisher Bay on Fraser Island and paired her effortless look with a low ponytail and flat sandals. The former 'Suits' actress - who was previously known as Meghan Markle before getting married in May - has had websites crashing with fans eager to get their hands on the coveted pieces she's been pictured in, which has now been dubbed 'The Meghan effect'. Earlier this month, the duchess opted for a silk olive shirt by the Swedish brand when she and Prince Harry visited Sussex, which was their first official visit to the county that features in their royal titles. Meghan has attracted plenty of attention for her simple-but-chic looks on the tour of her 16-day tour of Australia, New Zealand, Tonga and Fiji and even wore a piece from her pal Serena Williams' fashion line. On the second day of her royal tour when she went to Dubbo Meghan wore a grey blazer from the tennis icon's collection. Serena, 37, was thrilled that her friend sported her blazer - which has now sold out - and took to Instagram to reveal her joy, sharing a picture of the duke and duchess holding hands and smiling. She wrote: "The face you make when you and Duchess of Sussex Meghan have matching @serena blazers. (sic)"